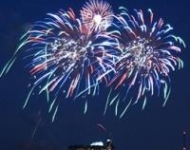 Come celebrate America's independence with a bang in beautiful Branson, Missouri! 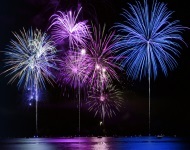 You'll find several fireworks displays throughout the area as Branson does it up big for the 4th galore at sidewalk sales, and other holiday celebrations in the area to enjoy. If you're planning to attend fireworks displays and other outdoor events, you're encouraged to bring your own chairs or blankets. Some venues offer seating, but make sure you arrive as early as possible to get the best view. 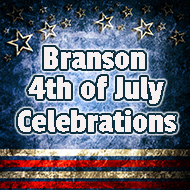 Branson is popular during the 4th of July holiday, so allow a little extra time to travel from point to point. You'll also want to reserve your lodging and show tickets several weeks in advance. Celebrate Independence Day where patriotism is a way of life...in Branson! Bookmark this page for further updates! Honor America Celebration's 29th Anniversary! June 30, 2019 Join us for an evening of family fun with an All American Barbeque on June 30, 2019. Enjoy dinner, children's activities, reserved parking, and reserved seating for our fireworks display as we Honor America. A deposit of $50 is required to secure your reservation for this special event. Your deposit will be applied toward your total on the day of the event. Your deposit is fully refundable if the reservation is cancelled by June 16, 2019. Reservations will become available online on April 1st, 2019. The Annual Fireburst fireworks show will be held again this year over the waters of Table Rock Lake near the Kimberling City Bridge! The Fireburst 2019 Spectacular can be viewed by car, boat or on foot. Over 1,000 boats will crowd the lake for this huge fireworks show on Table Rock Lake in Kimberling City. Just minutes from the lights of Downtown Branson. Fireburst will set off your imagination with an unbelievable fireworks show. Head to Kimberling City, south of Branson West, and bring a chair to enjoy the festivities from land as the sky is striped with color and blasting with this popping heard only once a year. For those who prefer to spend the holiday on the water, plan ahead for your day. Boat rentals can be hard to come by on this holiday. Or you can always bring your own boat and float the day away with thousands of people at the Fourth of July Fireburst. Fireworks show begins at dusk Saturday June 30, 2018 Bring your lawn chairs. Splash into the night with Night Water at White Water! You can play all day, and stay past dark with extended ride hours 10 am - 10 pm! Splash into your favorite White Water attractions in a whole new way at Night Water! Enjoy all 13 acres of rides and slides from 10 am to 10 pm! Come float Aloha River under the stars, test the evening rapids at Ohana Falls or dare to drop 75 feet in the dark on Kalani Towers! It's your favorite water rides after dark! Dive into Branson, Missouri's White Water where water rides and attractions will "wet" your appetite for summer fun in the sun! White Water is Branson's only outdoor water park and offers water-blasters, super-soakers, speed water slides, and a wave pool. Plus, Kalani Towers - the 6-lane Freefall and Racing thrill slide! Choose between two 75-foot freefall drop lanes or four mat racing lanes over 310-feet long. Night Water activities start at 5:00 pm and continue to 10:00 pm. on Fridays and Saturdays this summer! Night Water activities start at 5:00 pm and continue to 10:00 pm. Summer is in full swing on the lake, in the mountains. After our outdoor BBQ event, complete with live music, After dark the skies will light up to celebrate Independence Day and you won't want to miss it. After dark, the evening sky will come to life! Celebrate Independence Day in a way you won't want to miss. Join the Branson Landing's Annual Liberty Light Up - and celebrate Independence Day - In a BIG Way, a Day Early! 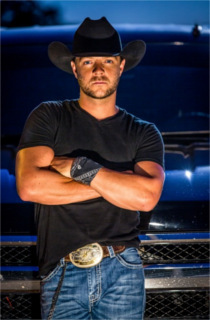 The Liberty Light Up Concert will feature Jason Pritchett & Steel Horses! Following their performance, the skies over Lake Taneycomo will fill with an amazing choreographed Fireworks Display Show produced by Gateway Fireworks Displays, from St. Louis, MO. 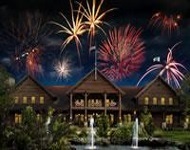 This celebration promises to be unforgettable with a choreographed opening highlighting a spectacular celebration of America's Independence - closing with a Gateway Fireworks Signature Grand Finale that will leave you in awe. It is very excited to be putting this race together for the 18th year in a row! Every year there is growth and it gets more and more fun. Expect this year to be no exception! Come over to Branson Landing and start your Independence Day festivities with a 5k or 10k road race on a flat course which winds through the front of beautiful Lake Taneycomo in Branson, Missouri. Prefer a stroll or have little ones who would like to participate? Sign up for the 1 mile run/walk which covers the distance of the landing. This race has been made possible thanks to all of the runners, the new ones whom we see come every year as well as the returning Firecracker 5000 participants. On July 4th, 2018 area residents, visiting families, and tourists will witness the oldest fireworks display in Taney County. The City of Hollister celebrates with its spectacular firework show with over 800 large displays. Beginning at 6:00 pm come and watch the 4th Annual Little Miss Firecracker Pageant. This 4th of July Show has become an annual tradition, with many families and visitors to the City of Hollister and the Tri-Lakes Area. 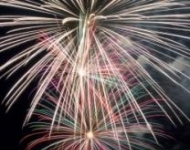 Come join the town's celebration of fireworks! Presented by the City of Hollister Fire Department and will be held at Chad A. Fuqua Memorial Park. Fireworks at dusk.